Hannover– 5th June 2014. Johnson Controls, a global multi-industrial company and leader in conventional automotive batteries and advanced batteries for Start-Stop, hybrid and electric vehicles, is launching a new VARTA automotive battery product range into the market. The Dynamic Trio (BLACK, BLUE and SILVER) will be complemented by two cutting-edge technologies AGM and EFB. 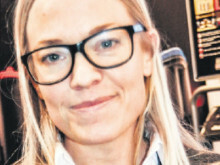 The number of demanding and environmentally-conscious customers is increasing. 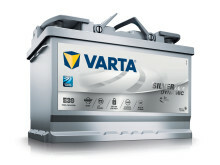 Nowadays, car drivers look for high-performance batteries with high starting power, longer life cycle and eco-friendly produced to highest quality standards.In response to these trends, Johnson Controls has added the AGM and EFB batteries to the tried-and-tested VARTA Dynamic Trio (SILVER, BLUE and BLACK), thus offering a new automotive product range. 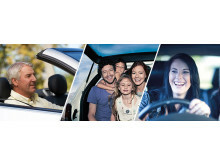 With the new VARTA automotive product range Johnson Controls can serve today’s car market and provide the right battery for all types of cars and consumers. The newly added AGM and EFB batteries are the perfect complement to any car– from drivers of their very first car to drivers of the most highly equipped vehicles with highest energy demands. Both batteries come with a longer service life performance and stand for reliability and high starting power thanks to PowerFrame® grid technology. 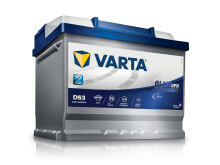 The VARTA BLUE Dynamic EFB battery is characterized by twice the level of endurance than conventional batteries. It fits perfectly to vehicles with a higher energy demand and the exact fit battery for cars with conventional Start-Stop functionality. The VARTA SILVER Dynamic AGM battery– a quality product made in Germany – stands for highest starting power, faster conductivity and offers three times the level of endurance than conventional batteries. With the new VARTA SILVER Dynamic AGM, customers will get the best technology for their car. It is also the exact fit battery for vehicles with advanced Start-Stop functionality with regenerative braking. 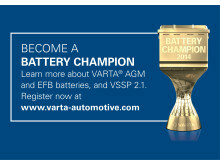 In order to familiarize workshops with the new products and technological changes, Johnson Controls has developed an online workshop competition for workshops: the VARTA Battery Championship. By participating in this online competition, workshops can learn more about the products and the underlying technology. The acquired knowledge enables them to make the most of new market opportunities and to find the best solution for each consumer according to his individual requirements. For more information and registration, please visit www.varta-automotive.com.